Edith was obsessed with puzzles. 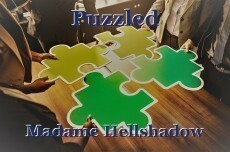 Her closet was filled to capacity with different kinds of puzzles. She did little else after her knee replacement. She awoke to a rap at the door. "Who could it be this early in the morning?" she wondered, as she grabbed her cane. Someone had left a jagsaw puzzle on her front porch. It was wrapped in a bow covered with smily faces. You are a genius, Madame Hellshadow. I am mesmerized by the originality of your macabre plots. How did you ever conjure such a diabolically unexpected perspective of ghoulish terror? I am profoundly impressed with your wildly intriguing mysteries of the paranormal occult. This page was created in 0.3542 seconds.